I hope that you have heard this term before and have begun the process of understanding what it means and how it is affecting your business. Believe me when I say that it IS going to affect your business going forward and none of us knows exactly to what extent. The NTCA has held seminars at Coverings, forums at TSP and published articles in TileLetter on this topic in the past year. Yet, it seems like we are just beginning to peel back the outer layers of the proverbial onion when it comes to understanding the regulation (29 CFR 1926.1153 Respirable Crystalline Silica), including “Table 1” – and what is NOT included in Table 1. Then we begin to see DOL issue “Standard Interpretations” and “Interim Enforcement Guidance” and it all gets very confusing. On the non-compliance side, a non-serious OSHA penalty was increased in 2016 to $12,600. If that doesn’t get your attention, a repeat violation penalty could be as high as $126,000. At this point, based on the testing that we and others have done, I believe most tile installations can be done safely and in compliance with the newly imposed regulations with proper engineered controls and tools. The one area that remains a concern is performing circular cuts larger than 4” in diameter. If you have a proven solution for this, please email me. As if this wasn’t enough to think about and absorb, California’s law called Prop 65 – which among many other things – is going to require manufacturers and/or re-sellers to put a warning label on every box of tile and bag of mortar and grout – basically anything that contains silica. This warning label will likely be different from manufacturer to manufacturer. We will not know the full impact of this until we see what the warning labels say, but you can bet it will not make our job any easier. It is also likely that these labels will appear on all products made for our industry regardless if they are made or shipped to California simply because the chance can’t be taken that an unlabeled product shows up in California. It’s important that you know the NTCA staff and volunteers are working hard to minimize the negative impacts of these issues on all tile contractors. I urge all to take a very proactive approach to these issues and educate yourself as quickly as possible. At the end of the day, we want tile consumption to rise across America so we must be prepared to deal appropriately with these new requirements. Happy new year, NTCA members! I know the next year comes around like, well, clockwork, but somehow it always seems to amaze me that we are back at the start of another new year. Of course, this is a time for resolutions that often get abandoned two weeks into the new year. But I am curious, have you ever made a business resolution that you actually kept (or a personal one, for that matter)? If so, would you be willing to share that with TileLetter readers? What was your resolution, why did you make it and how did you implement it in your business? Here at TileLetter, we have made some resolutions for 2018 that we do plan to keep. For years TileLetter was a news magazine that brought you information about things going on in the industry as well as technical and business stories and tips to improve your business. TileLetter.com brings you daily updates on breaking news, announcements and timely information for our industry. Log in from phone, tablet or computer to see what’s new each day. TileLetter Weekly and Enews & Views are short, digital newsletters that come out weekly, to alert you to significant developments and time-sensitive information in our industry. TileTV is a concise video-format news magazine that’s available monthly, with convention and conference coverage, demos and the popular “Question Mark” feature in which NTCA Training Director Mark Heinlein answers your queries. Of course, there are our Facebook pages – National Tile Contractors Association, NTCA Members Only and TileLetter, which also bring you timely stories and articles. As for TileLetter, we are making the move to become more of a technical/educational journal. We’ll still have News and Product briefs, with a short description and links to full stories on tileletter.com. But our printed content is looking to be more of a reference document – something you can come back to again and again for help in a challenging project or for information about more efficient business operations. We’ll also focus more keenly on our members, and their projects and showcase their work in the pages of TileLetter. So expect some changes, and let us know what you think. One of the stories I’d like to bring your attention to in THIS issue is the Tile Geeks Project technical project. This amazing labor of love brought together a group of tile professionals who enjoy working and networking together to renovate several areas at a farm that serves the local community, especially autistic adults and children. The charge was led by NTCA member and Tile Geeks administrator Justin Kyle of Kyle’s Tile in Ocean View, Md., and 15 friends who are all part of the Tile Geeks Facebook group, supported by generous donations of setting materials by LATICRETE and tile by Crossville, in addition to tool and other sponsors. 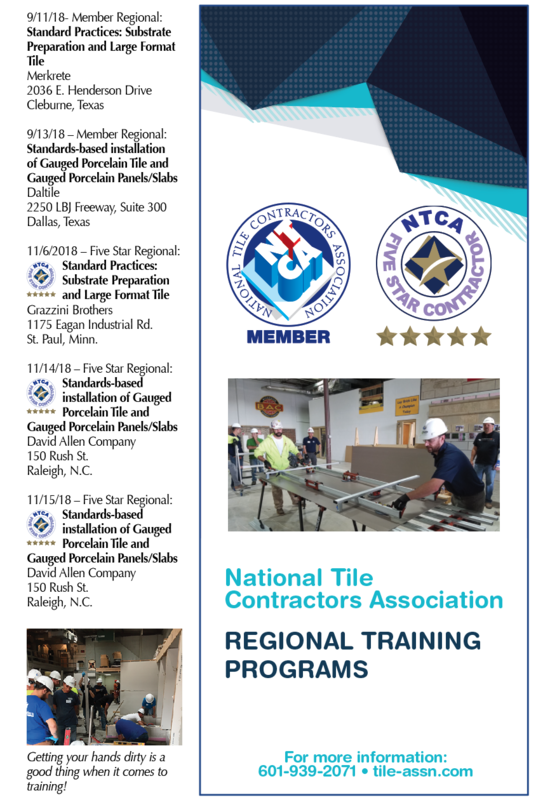 In our Benefits Box, this month we detail the upcoming schedule for the brand new NTCA Regional Training Program, which will bring 20 local opportunities for intensive hands-on training around the country. This is a member-only training opportunity that starts in February, so try to make it when it’s scheduled near you. And Amber Fox, the NTCA Five Star Program Coordinator, will bring you periodic updates on the Five Star Program, starting this month. We truly wish you a happy, healthy, prosperous 2018, and we pledge to do all we can to support you in that goal! In our last issue, we reported on the pilot member-only NTCA Regional Training Program held in October in New Berlin, Wis., developed by NTCA Training Director Mark Heinlein and NTCA Training and Education Coordinator Becky Serbin. The program was a huge success and provided 100% free, hands-on experience and training for a group of 20 attendees, supported by NTCA trainers and staff from manufacturer partners. As a result of this acclaimed event, many NTCA affiliate members are offering massive support to a full program of events in 2018, with Daltile and Crossville leading the bunch. In addition, ARDEX, Bostik, CUSTOM, LATICRETE, MAPEI, Merkrete and TEC/HB Fuller are supporting the program with financial donations. These donations are making possible a schedule of 20 dates for regional training at all regions across the nation. Thirteen will be open to local NTCA members, with eight events slated for Five Star Members only. This program differs from the NTCA Workshop program in that they are all-day events, exclusive to NTCA members only. In contrast, NTCA Workshops are evening programs, open for anyone to attend. Really big, thin tiles are here to stay. In fact if you don’t get on board with learning how to install them based on the brand new tile industry standards, you may soon find yourself on the outside looking in on some wonderful new contracting and installation opportunities. 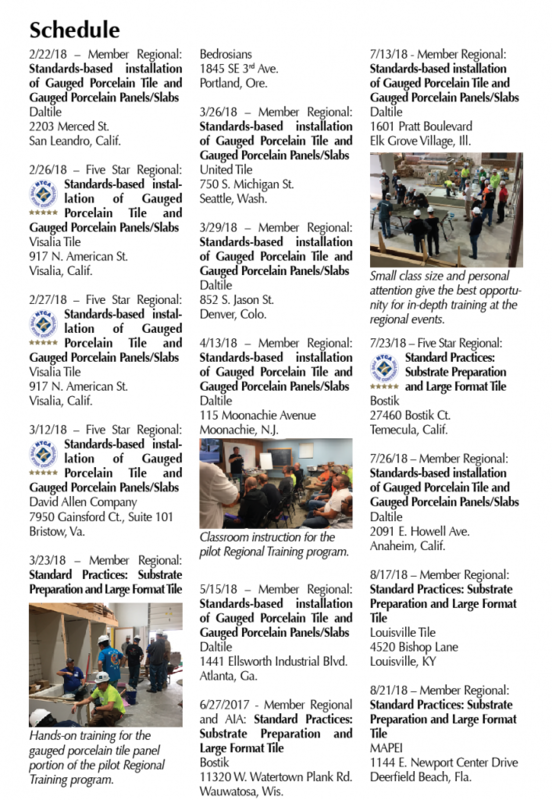 This program is your chance to learn about the basics of the tile industry standards and get an in-depth look at the new standards and methods for installing Gauged Porcelain Tile and Panels (GPTP). You will learn why this tile format is the wave of the future, how it is made, designs it is used for and the special tools, setting materials and techniques required to install it. What is a Gauged Porcelain Tile or a Gauged Porcelain Panel (GPTP)? What is ANSI, TCNA, ASTM? What are ANSI A108.19 and ANSI A137.3? Why do I want to know how to install GPTP? What are all of these specialty tools and why do I need them to install GPTP? Why do I need special training and a trained team to install GPTP? How is this going to help me make money? What is Qualified Labor and why does it matter to me? This program will take attendees on an introductory journey into the tile industry standards found in ANSI A108 and the TCNA Handbook for Ceramic, Glass and Stone Tile Installation. Attendees will learn how to navigate and use the ANSI A108 standards and TCNA Handbook, then will use their new knowledge to address some of real-world challenges in practical hands-on installations focusing on the all-important process of substrate examination and preparation for installing large-format tile. What are ANSI A108, ANSI A118, A136, A137.1 and A137.2? Why do I need to know about ANSI standards? What is the TCNA Handbook? Why do I need the TCNA Handbook? How do I use the TCNA Handbook? What are the different kinds of substrate and why are there standards for them? Why do I need to know how to examine and prepare a substrate? How do I properly prepare a substrate? Why aren’t some techniques good enough for fixing a substrate and setting tile? NTCA Training Director Mark Heinlein will present each program, with occasional assistance from NTCA Trainer/Presenters Robb Roderick or Luis Bautista, and CTEF Director of Training Scott Carothers. Local contractor members may also assist. To register for the free Regional Training Program in your area, visit www.tile-assn.com. For information about joining NTCA, contact Jim Olson at [email protected].